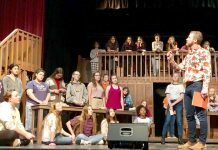 A group of eighth graders danced across a mat to “Fireworks” by Katy Perry, another group of students watched “My Fair Lady” and compared it to “Pygmalion,” and another group of fifth graders played Beethoven on Boomwhackers. That’s part of a typical day at the La Mesa Arts Academy (LMAAC) on the campus of La Mesa Middle School, currently in its first year. Here, the arts and academics play off each other and the students have found a lively rhythm. LMAAC kids love coming to school—they will tell you so excitedly, through just about any expressive medium. Thomas and other administrators in the La Mesa/Spring Valley School District (LMSVSD) wanted to establish a performing arts school for years, she said. She and other colleagues chased down that dream, hoping to reach and challenge students with art, music, literature, and dance. What the LMAAC staff sees now exceeds their hopes—students are doing more than going through the daily curricular motions, they are identifying with the different artistic mediums offered and have enthusiasm for all subject matter. Some students involved in the arts their entire life, while others came in with nothing more than an interest or yearning for a broader education. Out of 1,000 students on the La Mesa Middle School campus, more than half enrolled in LMAAC. La Mesa/Spring Valley School Board gave approval for LMAAC, which teaches fourth to eighth grades at the end of 2013. 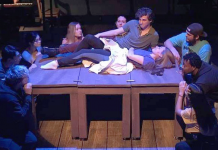 Jon Hayman and Dr. Mark Arapostathis received full-time release from the classroom to work on the administrative and physical changes that would be necessary to become a performing arts school (like turning an old woodshed into a theater). LMAAC hired 17 new teachers, all from LMSVSD. Thomas calls her teaching staff “superstars,” and refers to the elective teachers as “specialists.” LMAAC is shooting for the highest level of instruction, and ongoing training for all teachers is important to her. Thomas aims to have professional development for the teachers to understand what it means to be a teacher in a visual and performing arts school. “We are working with the California Artworks Project and they are coming in and doing development with our specialty teachers (music, theater, dance, etc.). 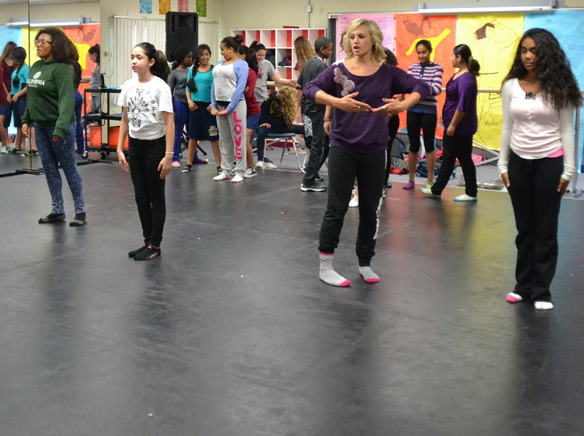 They come in and coach them, and during that time, these teachers are looking at the new Visual and Performing Arts (VAPA) standards, writing curriculum based on those standards, to help them plan instruction that is meaningful and has depth,” Thomas said. 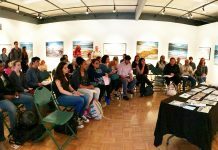 “On the flip side of that, what I call the academic teachers, are also getting training from the same [VAPA] group, and what they’re learning how to do is infuse their curriculum with the arts. This year, the focus is theater, next year, we’ll choose another focus, we have a three-year strategic plan,” Thomas said. While LMAAC’s teachers are veterans—20 plus years of teaching each retired teachers come in to work with the students as well. Ray Anthony, director of the San Diego Concert Band works with the LMAAC orchestra. His 42 year tenure includes time at Mt. Miguel and Valhalla high schools. “If you don’t have an administrator who cares about the arts, the arts get pushed to the back,” Anthony said. He worked with the Board of Education in Sacramento and became frustrated when funding for the arts halted in favor of other subjects that took precedence at the time. Voice ensemble, girls’ ensemble and guitar teacher John Law stood in his classroom with wall-to-wall trophies, and echoed Thomas and Anthony’s sentiments on teaching arts to children. “This is the most unique school probably in San Diego because not only the arts, and technology, are completely covered, but we encompass the whole child. From our community service and character education programs, we’re teaching to the whole so they can be a contribution to society at this age. I’ve competed against hundreds and hundreds, and it’s exciting to be here,” said Law. “Here” at LMAAC, is where Law, who has taught for 33 years, loves finding raw talent or molding beginners, teaching them music and watching them shine. His ensembles are requested at community events. Though LMAAC begins at fourth grade, students can enroll for any of their fourth to eighth grade years. After completing the application process, the student’s name is entered into a lottery. LMAAC is currently taking applications for the 2015-2016 year until December 12. Anyone can apply, though for the time being, priority is given to students living within the school’s boundaries. Thomas is dedicated to opening the school to as many students as she possibly can. “Enrollment is open to any child in San Diego County. We have parents who have relocated their home to be closer,” Thomas said. The response of parents has been extraordinary, she said, and more accomplished in a short time than she thought possible. It seems the visual and performing arts are a big draw for parents, and the stage has been set for a second act. Thomas and her staff, awarded start-up funds by the school board, hope to have their non-profit, La Mesa Arts Foundation, in place by the end of December. Their vision is for improvements within, such as a renovation of their auditorium and a piano and keyboarding class, which parents requested. LMAAC’s goal is to institute “leveled” classes, kind of like a college, Thomas said. LMAAC is on a trimester system, three twelve week sessions, in which students get foundational art classes, in addition to one-year long specialty classes that interest them the most. Keeping with the idea of bringing in professionals to work with students, conservatory classes are offered as well, such as a dance troupe on Mondays afternoons, jazz band that meets two days a week, and Anthony’s work with students playing advanced strings. All of LMAAC’s classes and VAPA standards, incidentally, work extremely well with the new Common Core standards, according to Thomas. “Common Core is having children take control of their learning, the ‘What tool do I bring out for the right situation?’ and that’s what we’re teaching them, confidence,” she said, noting that what a student uses to succeed in Band, like posture, reflective learning, or language, will certainly (and often, to their pleasant surprise) help them in math. “It all blends, it’s beautiful,” she said. Eighth grader Grace, “Concert Mistress of the Orchestra” as Anthony called her, showed a satisfied look of life purpose, an indirect smile on her face as she led fellow students in tuning up. Tall girls, short girls, giggling girls, serious girls, all glided carefree in the school’s new dance room to blaring music—not one of them looking like they would rather be somewhere else. Sixth grader Ben was very impressed with his art class. Sixth grader Lily said she was nervous at first, because of so many people. “I got lost but someone took me to my class. I love my art class!” said Lily. The inaugural year at LMAAC, not halfway through, has surpassed expectation and fulfilled Thomas’ vision. Thomas may be the heart of the school, the blended curriculum, the mind, but the LMAAC students are the pulse of the school that keeps creativity flowing straight into the future.